Before Pioneer Courthouse Square, the block was a parking lot. 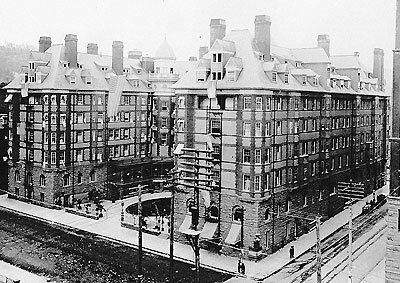 Before the parking lot, the block was home to the Portland Hotel (aka Hotel Portland), which opened on April 7, 1890 (and before the hotel, one of Portland’s first schools occupied the location). We have in this hotel an instrumentality that will be of greater service in building up the city than any other single thing could possibly be. It will speedily become another sign and attestation of the pre-eminence of Portland in the Northwest, whose chief city should have, as it now does have, the finest, largest and best hotel. A city is judged by its hotel accommodations, and on this basis of judgment Portland henceforward will take the rank she deserves. The Portland Hotel sported 326 elegant guest rooms distributed over 8 floors and everything else one would expect in a modern hotel: parlors and sitting rooms, a restaurant, a bar, a ballroom, dining rooms, etc. It also boasted steam heat and gas and electric lights. Railroad man Henry Villard, who also spearheaded efforts to build Union Station, began constructing the hotel in the 1880s, but ran out of money. A group of Portland business men raised money to finish construction by selling subscriptions, and the hotel was completed. In 1951 the hotel was razed and replaced with a parking lot, as developers were wont to do in the 1950s.